Fellow students at Tehran's Elm-o-Sanat (Science and Technology) University held a ceremony today on would have been the 27th birthday of Kianoush Assa, a graduate petro-chemistry student who was killed by security forces during protests on June 15, 2009. 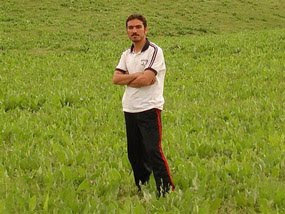 Kianoush's family searched for him for almost ten days, during which time security and judicial officials gave them the runaround. His body was finally identified by his family at the coroner's morgue on June 24. The following is a video of Kianoush playing the tanbour. RIP. A semi-official news agency announced that a travel ban had been placed on former reformist President Mohammad Khatami, but the report was denied thirty minutes later by a source close to Khatami. 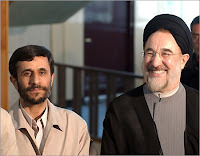 At 2:55 PM, Fars News, linked to the Islamic Revolutionary Guards Corps, claimed Khatami had been banned from making any trips abroad in an article that refrained from using any honorific such as 'former president,' 'mister,' or even the statesman's religious title of hojjatoleslam. According to the political reporter of Fars News Agency, Hojjatoleslam Abbas Amirifar, executive secretary of the Preachers' Society of Tehran, referring his organization's gathering last night, said: Last night at the private meeting of the clerics of the Preachers' Society, this intelligence official gave news of the foreign travel ban on Seyed Mohammad Khatami, head of the Baran Foundation. He added: In this regard, this official stressed that Khatami recently intended to leave the country. In an obvious attempt to belittle Khatami, the post simply referred to Khatami as the head of the Baran Foundation. The foundation, whose motto is 'Freedom, growth, and prosperity for Iran,' was created by Khatami after his second term, but is run by Morteza Haji, a former minister of higher education who was briefly arrested after the opposition protest rallies on Ashura Day, December 27, 2009. The foundation's documents were sealed and confiscated by intelligence agents at the time. The Baran Foundation web site posted an article which denied Khatami had intended to go on a foreign trip.